Why Did I Go to Central Asia? As my husband grinned, thrilled with his brilliant idea, I blinked, lifted my jaw from the floor and shook my head. He’d done it again. My knees were weak. A falling-in-love again moment. I’m doomed by the way this man and his madcap, audacious, why-the-hell-not ideas get me every time. Marco Polo. Silk Road. Afghanistan. Samarkand. Adventure. Time slowed down and I felt the adrenalin surge into my body. My stomach lurched and flipped at the same time. We were standing in a bookstore in Seattle leafing through travel books. We’d committed to doing a round-the-world trip with our kids but were still in the planning stages. This Marco Polo idea ended up becoming a central organizing theme for part of our journey and yes, it was adventurous. It is not easy to travel independently from Xian to Turkey but we did. Even with all the fussing about visas and travel passes and illicit street-corner money-changers it will always be decidedly a high point in our year of travel. Apart from the travel memories (good and bad), the photos and the certainty that I know I’m not done with this part of the world, what I also found myself mulling over was my initial reaction to Murph’s suggestion. He tripped a fascination I didn’t know I had, but there was definitely something there, where did it come from? Taking it from the top, how did I get from Marco Polo to Adventure? 1. Marco Polo. Sure everyone knows who Marco Polo was and that he traveled from Italy to China. Easy. Not exciting. 2. Silk Road. Part of the Marco Polo baggage. He went to China and brought back silk. 3. Afghanistan. Hmm. OK. A little geographic fuzziness happening here. I think MP went through Afghanistan but he may not have. It’s in the general area though. Aha! There’s the first source of my adrenalin rush: nothing like pondering taking your children into a war zone to get a fight-or-flight response going. I remember being 10 or 12 and watching the classic movie Kim. I was entranced. In this post-Harry Potter era it’s interesting to note that this is one of the few movies from that time with a child as the central character. Maybe that’s why the story fascinated me so much. I found a copy of Rudyard Kipling’s book at the library and read it. I pulled out encyclopedias and tried to find out more about the “Great Game” – and trust me, I had books A (Afghanistan), B (Britain), I (India), E (East India Company) and U (USSR) all open on the floor around me by the time I was done. I’m sure I dreamt about being independent enough to travel alone as Kim did. So, now that I’ve been to Central Asia what do I think? I plan to go back. There’s too many points on the map above that I didn’t get to see. You should go. I mean it. This is one of the few places where you will actually feel like ye olde adventurer when you’re there. Check back on 11/28/2012. I might be able to help. 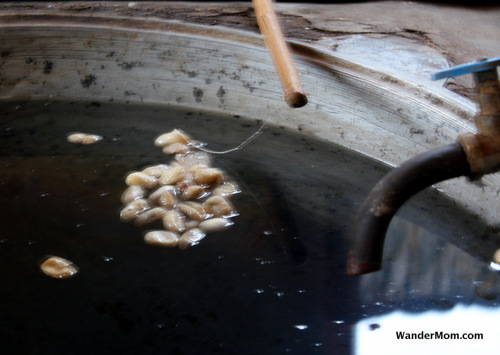 This entry was posted in International Escapades and tagged Central Asia, Silk Road, Uzbekistan on November 19, 2012 by wandermom. 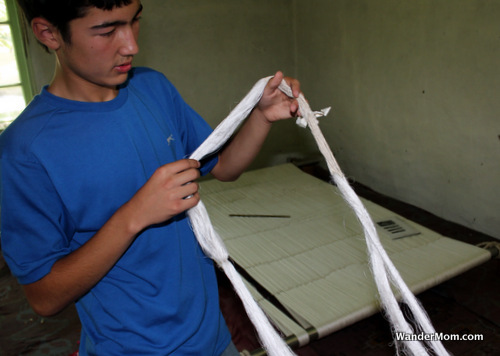 Part II on our visit to a traditional silk factory in Margilan, Uzbekistan. This time focusing on the process used. Which, in this traditional factory, is dyed using natural dyes made from plants and plant extracts. 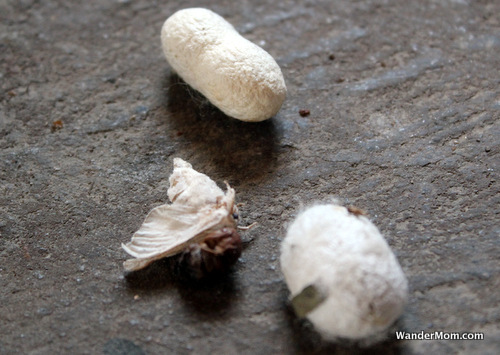 This entry was posted in Uzbekistan and tagged Margilan, Silk, Silk Road, Uzbekistan on November 16, 2012 by wandermom. These women are silk-weavers at the Yodgorlik Silk Factory in Margilan, Uzbekistan. 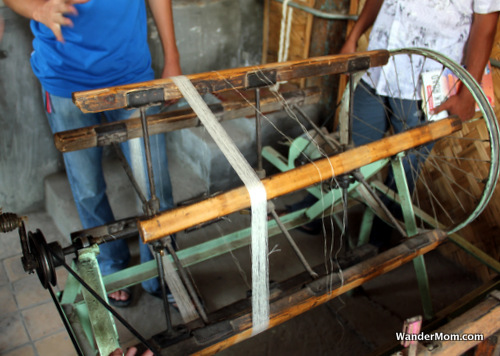 This “factory” is the largest traditional silk factory in Uzbekistan – with silk-worms, mulberry bushes, drying cocoons and reels of hand-spun natural silk. On the day we dropped by (unannounced), we were the only visitors and I think these weavers were a little put-out that we were disturbing their gossiping. They were also particularly surprised that we were even bothering to visit Uzbekistan. I held up our Insight Guides Silk Road guidebook in explanation at which point one gal, the one in the pink dress above, imperiously held out her hand for the book. I handed it her open on the page referencing the factory. She took it, flipped back a couple of pages, yelped in surprise and called to her co-workers to come see (I’m assuming that’s what she said because they came over – my Uzbek is non-existent). There was much fussing over the book and pointing at pictures and giggling, as we stood by confused and bemused. Thankfully the owner – who was playing tour guide for us – explained: the women had spotted a friend in the photos in our guidebook. If recognized a friend in a guidebook on Ireland (or Seattle) I’d find that pretty trippy too. 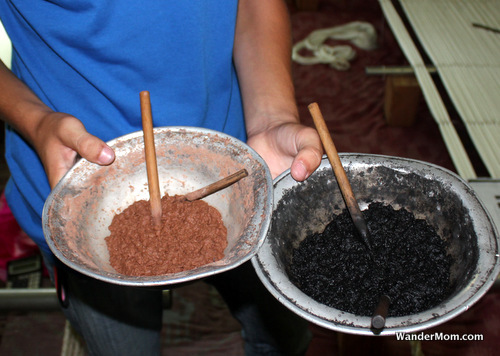 This entry was posted in Uzbekistan and tagged Fergana Valley, Margilan, Silk, Silk Road, Uzbekistan on November 8, 2012 by wandermom. The female border guard admonished me in stern tones, dismissively tossing my completed customs form into her trash basket. My temper at the petty bureaucracy flared. Ire duly raised, I opened and then quickly closed my mouth. Best not to antagonize. 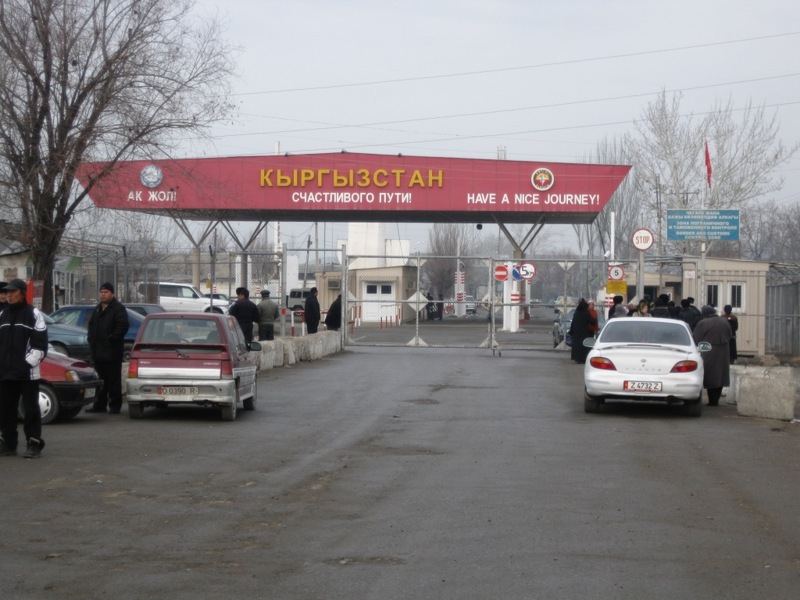 The object was, after all, to get through this border crossing, not to be shooed back to Kyrgyzstan. The woman was in her late twenties, maybe early thirties with manicured hands and painted nails. She had obviously spent time on her hair and makeup before coming to work. She was pretty and looked stylish in her uniform. Even though she was bugging me to my back teeth right then, I felt a little sad for her, the very definition of all dolled up and nowhere to go. I sighed, took another blank form and started copying out my passport details for the third time. As my hand wrote out the familiar information, I felt more like an observer than a participant. I wondered what her life was like, as the only woman at this rural border crossing between Osh (Kyrgyzstan) and Andijan (Uzbekistan). Was her sternness with me a Central Asian version of a woman trying to be better than her male co-workers? On cue, a guffaw echoed across the partition from the office next door where, it seemed, my husband was holding court with the male border guards. “OK. Here you go.” I handed over the new form. She started to review. I passed the neatness check (yay!) and she asked for my passport (yes, you read that right, there was a neatness check before a data check). She stared at me, this time definitely suspicious that I was going out of my way to cause trouble. Another open mouth, close mouth goldfish impression from me. I really didn’t know how best to play this one. At this point, I think she decided I wasn’t the sharpest tool in the shed. Decisively, she struck out AMERICA on my form and wrote in IRELAND for me. With a flourish she tore off my copy and dropped it in front of me imperiously. (Call me cautious, but I thought it best not to make any assumptions at this point). She nodded. She was done with me. It took me a good five minutes to gather all my belongings and re-pack my bag. I went outside and took a seat on the wall between my boys. I could see Murph still in animated discussion with his new best friends – and still making them laugh. He saw me sitting on the wall, said something to his buddies and came running over, cheerily calling “just two minutes” back to the guards while saying “I need the kid’s passports” to me. But when he stood in front of me he hastily reached under his shirt and palmed our four U.S. passports into my hand. I made a show of standing my (checked, cleared) pack up and tightening the straps with one hand while hiding the offending passports through a hidden side zip with the other. “Mom! What are you doing?” BigB asked, just a touch too loudly. Distraction, a parent’s greatest tool – in any situation. Finally we were done. Start to finish it had only taken two whole hours to pass into Uzbekistan. We compared notes are we walked down the road. Murph made fun of me when I told him how the woman had commanded that I must live in Ireland. I couldn’t understand how he’d managed to get away with having an Irish passport and a U.S. address. I figured it must have been because he’d made them laugh. “Humor wins again”, I thought. This entry was posted in Uzbekistan and tagged Andijan, Borders, Kyrgyzstan, Passports, Uzbekistan on July 31, 2012 by wandermom. Genghis Khan sacked Bukhara Uzbekistan in 1220AD. The story goes that he chastised the citizens of the city saying, “If you had not committed great sins, God would not have sent a punishment like me”. Whether he actually said this or not, you have to agree that it’s a great plundering conqueror line. But, even in his eagerness to lay Bukhara to waste, Genghis was impressed enough by the Kalon Minaret (pictured above) to order it spared. So, this building, constructed in 1127 and noteworthy, purportedly for the first use of decorative glazed tile in Central Asia, stands proudly today. 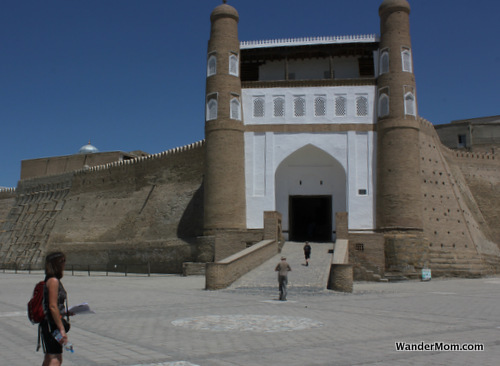 This entry was posted in International Escapades, Uzbekistan and tagged Bukhara, Bukhara Ark, Kalon Minaret, Silk Road, Uzbekistan on July 11, 2011 by wandermom. 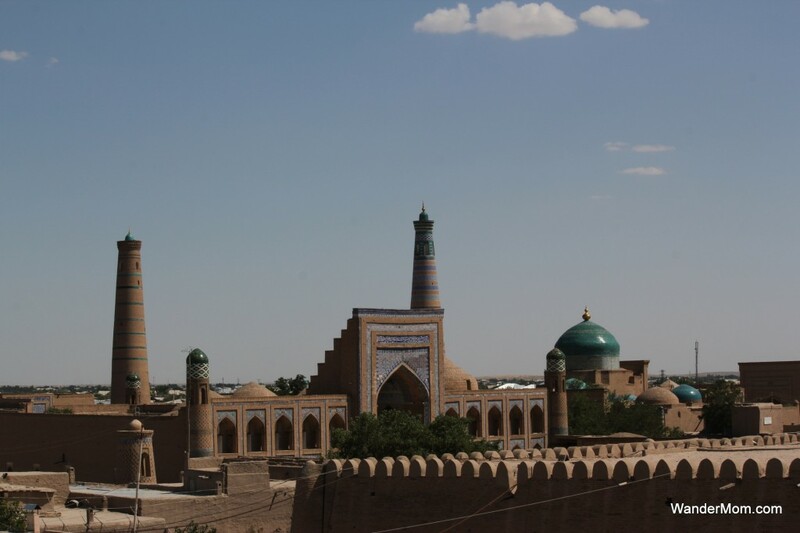 There’s little to do in the old center of Khiva, Uzbekistan except sit and admire the view. The dusty sand-colored buildings are ornately tiled in blues and greens. The minarets stand like lighthouses in the desert over an old town, frozen in time, and a new town sprawling out around the 17th-century walls. 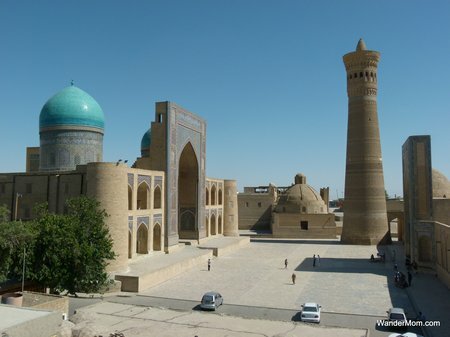 This entry was posted in International Escapades, Uzbekistan and tagged Khiva, Silk Road, Uzbekistan on July 8, 2011 by wandermom.